Fox Searchlight Pictures theatrical poster for 12 Years A Slave. The following is a spoiler review for 12 Years A Slave. At the 86th Academy Awards in early 2014, 12 Years A Slave was nominated for 9 awards, and only American Hustle & Gravity were nominated for more (both 10). In a less stellar year for movies — and with a little bit of luck on their side — Ejiofor and Fassbender might have left the night with Academy Awards, but, in the end, the film only received 3 Oscars. But it did receive the most important award of them all – Best Picture. And the film deserves the honor. 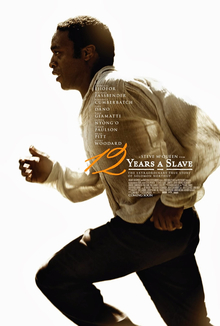 12 Years A Slave is an adaptation of Solomon Northup’s book of the same name. It follows Solomon Northup as he is captured in Washington and sold into slavery. It is a horrific tale of slavery, and is one of the most brutal films of 2013. One of the most brutally honest films depicting the age of slavery. Such a film deserves a masterful score. Its composer is the legendary Hans Zimmer, and his score is strong. Though, I did find problems with it. At times it just felt like a knock-off of his own ‘Time’ tune from Inception, which is disappointing, as this film deserved a unique score. The cast of the film is extraordinary. Let’s talk about the secondary characters first. Michael Fassbender gives one of the most terrifyingly mad performances of memory as Edwin Epps, he is a magnificent actor, and he has a lot to do with this film being as powerful as it is — I don’t think I’ll ever forget how rabid and insane he looked, at times, this film. In comparison, Paul Dano’s character comes off as a young spoiled man, annoyed by the talent of Northup, but his character is incredibly important to the plot, though. And even though I will say that I thought Dano did a good job in the role, I would’ve liked someone as riveting as Fassbender for the role. Cumberbatch, like Fassbender, is as good as expected, but I wanted more of him. But I did find a problem with one of the star actors. Brad Pitt produced this film, and his production company helped this film greatly, but he should not have been a part of the cast. Whenever Pitt is on screen I am taken out of the film – I just see Pitt, not Samuel Bass. Bass is too important for the plot to be ruined by that. Lupita Nyong’o is one of the hidden gems of this film. Nyong’o plays Patsey, Epps’s favorite slave, a woman haunted by the horrific acts of her owner. Her last scene is haunting, and you sympathize with her as Sarah Paulson’s Mary Epps and Michael Fassbender’s Edwin Epps both terrorize her in their own cruel ways. Chiwetel Ejiofor is the star of the film, though. Ejiofor, of course, plays Solomon Northup – and is completely believable from his very first scene. This is, without a doubt, his biggest ever role – and it will be the one he is remembered for. Once a talented actor, this film turned him into a full-fledged star. Here at the end, I have to praise Steve McQueen and Sean Bobbitt. This film isn’t just brutal, it is beautifully crafted, and features haunting brutality. The stand out scenes are, of course, the hanging scene and Patsey’s flogging. Scenes that stick with you in part thanks to emotionally haunting cinematography and direction. Final Score: 9.5 out of 10 – Steve McQueen, Sean Bobbitt, and John Ridley have crafted one of the most brutal looks at the age of slavery; a near-masterpiece.